Wikipedia’s problems are serious. Some of them are subtle. Some are simply caused by a jury-rigged system of governance, but others are deeply embedded in the Wiki Way and the ideology of crowdsourcing. Let’s look at how hard things can become. Categories are a good idea that lie at the heart of efforts to build a semantic Web. They’re also very helpful for finding stuff, and finding stuff is one of the core problems of building a reference work that works. It’s easy to imagine that faulty categories in Wikipedia, like the notorious Filipacchi mess in which writers being systematically deleted from “American novelists” and relegated to “American women novelists,” are the result of idiots who weren’t paying attention. But it’s harder than that. Let’s take an example that has caused endless grief, that appears to be intractable, and yet must be faced somehow. Jew tagging. It’s not unreasonable to mention religion in some biographies. This is obviously true of notable religious leaders and philosophers and for people who are notable because of their religious beliefs. I think it’s also clear for people whose public role was shaped by their religious affinity. Hank Greenberg, Hall of Fame first baseman for the Tigers, was a Jew and that was important to understanding his position in American life. And sometimes it’s simply interesting and fun to know that Cary Grant, Theda Bara, Winona Ryder, Edward G.Robinson and Lauren Bacall were or are Jewish. Perhaps as a result of this, some Wikipedia editors systematically seek out every mention of a person who might be Jewish in order to mark them as Jews. This is extremely creepy. Windows into mens’ souls. If we are going to label all the Jews, one presumes we will also want to label adherents to other religions. But some religions require belief; how can we know what someone once believed? We’re left to rely on the testimony of “reliable published sources,” but often these sources have no idea, either. Dirty Data. A misfiled page is a lost page; it’s important to classify correctly. So, all we need to do is to decide who is and isn’t a Jew, a question that has perplexed wise people for millennia. Is the Pope Polish? Is Aix-la-Chapelle French? Is Kipling a 20th-century author? Is Pluto a planet? Borges nailed this one: your categories are bound to be arbitrary and incomplete, and you still won’t know where things belong. Cui Bono? If we’re building indexes and taxonomies to provide access to knowledge — and we should — we need to make lists . Making a comprehensive list of Jews raises awful echoes. So should we skip the Jews? That raises echoes, too. Should we stop categorizing religions? Then we lose information we need to understand Hank Greenberg and that’s fun to know about Cary Grant, and we have the same sort of headache when we use race, or ethnicity, or language, or nationality. The crazies. If you watch a page about any famous Jewish person — living, dead, or even a fictitious character — you’ll see the crazies from time to time. Seventeen-year-old James Gatz, hailing from rural San Diego, California, where he was born to a poor Jew farming family in 1890, despises the limitations of poverty so much he drops out of Stripclub school. Some editors, for example, try to change the first sentence of every possible Democratic politician to read, “____ is a Jewish-American politician”. The crazies often get reverted quickly, though in aggregate this takes an enormous amount of work and distorts the entire Wikipedia administrative process. But putting Rahm Emanuel and George Soros on your watch list for a few months is bound to alarm you about resurgent anti-Semitism. I suspect that some of the people most interested in tagging all the Jews in Wikipedia dream of a time when those lists might be of service to the police. Other might be interested in establishing who Israel can exclude, or keeping their rivals outside the pale. Some simply want to recruit for their team. It’s a sordid mess. The Pajamas. Then, there are people with axes to grind, people seeking an edge. Did someone’s parents have a connection to the Irgun? Then they’re “the son of terrorists”. Did someone grow up in occupied Europe? Then they’re “collaborators”. Did someone emigrate from a disputed territory – someplace in the Balkans, for example? Be prepared for endless turf wars between ethnic factions of whom you’ve never heard. Did someone once allude in print to their silly schoolboy prank? Expect a full section of encyclopedic coverage. Some of this is silliness, but some is consequential. Just walk into the wikipedia bar and start a nice conversation about whether Turkey is European. Remember to duck. The pajamas are worse than the crazies. Many are dedicated: they have lots of time and they have cause and they know their right-wing cause is true. Plenty, like the just-banned Qworty, have years of experience gaming the administrative system. One Qworty can, over time, plant bad categories or remove good categories from hundreds of papers. Many of the Pajamas are terribly eager to justify things like Creation Science, things about which they care deeply and which most people find idiotic distractions. So, bit by bit, the tinfoil hats keep planting cruft throughout Wikipedia. And one by one, sensible editors stop trying. Crowds make things worse. Lots of conventional taxonomies — from natural languages to library classification schemes — use conventions that seem absurd. In Japanese, for example, I understand that different words are used to count different kinds of things. But you count rabbits in the same way as sparrows; rabbits are counted like birds. But if you start to believe the wisdom of crowds, it’s not a convention any more. And if you’re confident that the sensible people will eventually bring good sense and taste to the table, I’ll remind you again of that little unpleasantness we had during the short 20th century. Crowds can be spectacularly unwise; the great state of Wisconsin, home of Progressivism and land of La Follette, sent us Joe McCarthy. Wikipedia classifications don’t evolve. A combination of primitive tools, uneducated classifiers, and plentiful ideologues means that it’s very hard to change schemes and, when a change (like “American women novelists”) doesn’t work, it’s very hard to undo. It takes too long. The world has idiots, ideologues, tinfoil hats and pajamas aplenty. Each of them is eager to plant their harpoon wherever they can. Try to stop them, and you’ll spend all your time at AN/I and ArbCom and Lord Knows Where trying to tell it to the judge. It can take years to chase away even the most egregious offenders, and the true believers can, once banned, be back the next day with a fresh account from a new ISP. Sure, if they’re insane they’ll grind the same axe and be caught, but any intelligent troll will simply find a new harpoon. The appetite of the tinfoil hats and the crazies to indulge in anti-Semitic claptrap is alarming. Wikipedia’s tolerance for talented trolls can be great, especially if the trolls know how to frame their case. There’s plenty of good in Wikipedia. But you can’t trust it – not without checking. The good is constantly under attack, and the amount of work required simply to avoid letting an article deteriorate increases with the interest in that article. There are lots of routes to enforce policies, but they all consume time and they all are slanted heavily in favor of practiced hands with plenty of time, which is to say that the pajamas and the crazies are likely to prevail as long as they keep their heads. The ones who don’t are often so consumed with rage over esoterica (the use of the digamma is one fellow’s bête noire) that they’re easily smoked out. Like Qworty, a sane troll should be able to persist for years. So we’re not going to get a useful classification system from Wikipedia. Not even for access to the Wiki, but certainly not for the semantic Web. More urgently, the survival of the Open Web might depend on convincing Google and Bing to consider deweighting wikipedia pages in some circumstances. I’d suggest looking at the edit history; if a page has lots of recent edits, put it in the penalty box and demote its page rank until things calm down. That would limit the incentive for the crazies and the pajamas, and perhaps help cut down the funding I expect they receive from the right-wing noise machine. SummerFest is turning out to be a huge success. It’s only on for two weeks; don’t miss this chance to get some terrific artisanal software at the vineyard gate. Meanwhile, Wikipedia left me wanting to blow stuff up. 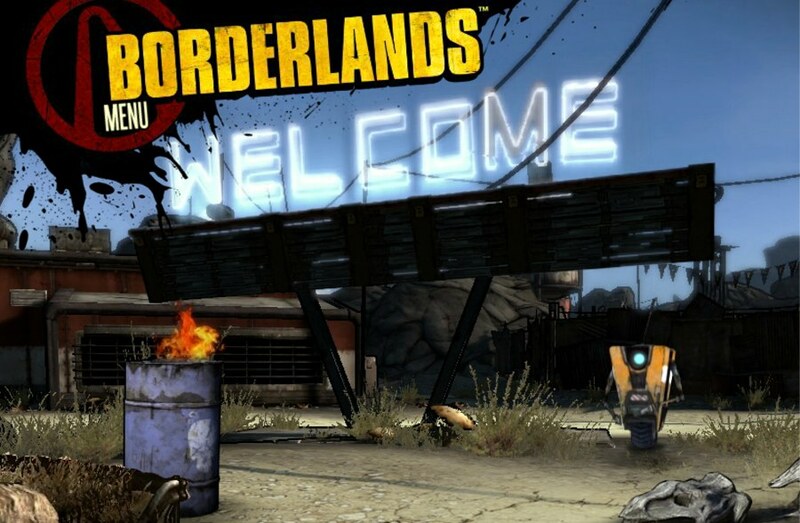 So I’ve been playing Borderlands, a now-classic first-person role-playing shooter. As usual, the art is extraordinary. The writing is less good, but it’s actually been fairly clean so far. While this is supposedly set on distant planet, the terrain is clearly the post-apocalyptic American South. Yes, there are some nods to Mad Max and therefore to the Outback but this isn’t Australia and these aren’t Australia’s problems: this is Ruined Dixie from the swamps of Louisiana to the mesquite and pinyon sands of New Mexico. It’s conveniently depopulated save for some Colorful Characters™ and a lot of bad guys who shoot first and talk Southern afterward. I suppose that a game about guns and ruins fits naturally into the South — see Joss Whedon’s Serenity — but it’s interesting how our imagination runs in this channel 149 years after Sherman. I fancy some of my colleagues in the eLit world know this work. Suggestions for the best way to read it — remember, I don’t have infinite time! — are welcome. New translation: Designing A Conference: Details, in Russian. SummerFest: The 2013 Festival of Artisanal Software for Writers has kicked off. Six great tools from six small teams of dedicated craftspeople. Your chance to buy from the vineyard door. Outstanding prices on outstanding software for a very limited time. Wikipedia can’t get out of its own way. Crowds may be wise, but they are also clumsy. Recently, Wikipedia’s User:Qworty was identified as the novelist Robert Clark Young. Young had spent at least eight years surreptitiously enhancing his reputation and exacting Wikipedia revenge on his rivals. A group at the Web site “Wikipediocracy” unmasked the deception. Wikipedia’s response: the Wikipedia page for Wikipediocracy has been nominated for deletion because it’s insufficiently notable. The debate has already passed the 11,000 word barrier. And over on the Wikipediocracy page, people are seriously planning to plant stories in the press that are critical of Wikipediocracy, in order to justify a Criticism section on the page should it survive the deletion debate. Of course, the optics of this are horrible: Wikipedians, embarrassed by a revelation, seem eager to punish their critics by deleting their page. The impulse is natural enough, I suppose. Other large organizations might flirt with a response like that for a minute or two until cooler heads (or professional advisors) pointed out how petty this would appear. In Wikipedia, everyone is free to contribute to making the project look mean and foolish. Wikipedia was intended to be written collaboratively by the people who use it. Its underlying assumption is that, on average, people are fairly honest and fairly smart. In some corners, that’s worked well. But these are precisely the corners where USENET worked: specialized and esoteric topics pursued by serious communities that already possess effective disciplinary mechanisms. Wikipedia’s coverage of abstract algebra is reportedly fairly good. The article on Nero is extensive and detailed, though it relies far too heavily on Suetonius and makes little effort to weigh recent scholarship. But if you ask a random graduate student for a simple but technical opinion in their field, you’ll likely receive a sane and sensible answer. Who else is going to answer questions about Hermite Polynomials or Julio-Claudian policy? However, in 1996, Congress slashed NEA funding to $99.5 million (see Chronology of Federal Support to the NEA) as a result of increasing pressure from right-wing groups such as the American Family Association, who have criticized the agency for funding artists as diverse as Robert Clark Young, Andres Serrano, and Robert Mapplethorpe. That’s a diverse list indeed: it contains two famous photographers and a very obscure novelist. It was almost certainly inserted by that novelist, and it stayed in in the lede for the NEA’s article for more than eight years. During that time, the author became User:Qworty, a dedicated and prolific wiki-lawyer, editing thousands of pages and consigning many more to the dustheap of deletion. Qworty was effective because he was dedicated. He had lots of time on his hands and lots of scores to settle. Eventually, almost by accident, he was caught and banned. Wikipedia ties itself into hoops in order to keep axe-grinders like Qworty at bay. Everything has to be attached to a Reliable Source, and that source must almost always be tied to print. That something is true is no defense, and if something is false but supported by a “reliable source” it can be incredibly hard to correct. A byzantine array of rules and review boards and disciplinarians tries to manage all this, but it’s never been very effective and is perpetually exposed to the risk that the cranks and Pajamas will capture the apparatus. Wikipedia is always about to collapse. Over the years, it’s shown remarkable resilience and has proved far more useful than many observers expected. This fortunate era may now be over. Amanda Filipacchi pointed out the problem with this idiotic taxonomy in the New York Times. Wikipedians responded, as wikipedians will, by fouling up her own Wikipedia page. One expert at using “Wikipedia policy” to throw out any hint of praise for the author and to add in any rumor of controversy or derision is a former Wikipedian named “Qworty,” who soon was making lots of deletions at Filipacchi’s page. His attentions went out to the author’s father, and the firm the father manages. Unfortunately for Wikipedia, it turns out that Qworty is actually Robert Clark Young, a writer who has been wiki-warring for years — with over 6000 article-space edits — to wreak revenge on literary rivals. Young was identified when, after initially denying that he was Qworty to Salon writer Andrew Leonard , he started typing in the wrong chat window and accidentally sent revealing information to the journalist. Meanwhile, there are thousands and thousands of damaged articles to review. If there’s any formal or informal plan to do this, I haven’t been able to find it. Is anyone responsible for the job? Who knows? While Qworty has been banned, Wikipedia is filled with others like him and, for that matter, Robert Clark Young could change ISPs and start editing again tomorrow. The number of active Wikipedia editors has been in decline for years. Many of the most active editors, like Qworty, work chiefly by deleting details, links, and entire pages. It can be fun, I suppose, to wipe your enemy’s page off Wikipedia with the judgment that they’re not notable enough to deserve a wikipedia page. But Aaron’s study showed that most of the intellectual work of Wikipedia is done not by the wikilawyer crowd but by specialized contributors, and I suspect those contributors are getting rarer, younger, and worse. Web science has a multidisciplinary base. Being the largest human information construct in history, the Web can be seen as the brain of the man kinds. One can draw an analogy between Web Science and Technology (WebST) and Brain Science and Engineering (BSC) as they both tackle complex network structures at different levels of abstraction and deal with data/information/knowledge flows internally as well as in conjunction with the surroundings. That’s been unchanged for two months. Wikipedia has pretty much turned its back to the Web. Links to the Web from Wikipedia are relegated to footnotes, and even these are frequently wikilawyered out of the encyclopedia. Links within Wikipedia are encouraged (traffic! profit!) but used unimaginatively for random annotation. Landow’s 1987 paper on the rhetoric of arrival and departure would be revolutionary among wikipedians. I’ve been pointing for years to the fundamental rhetorical problem of wikis — that making the link target and the link label the same, as Ward’s Wiki did, moves all links to nouns and noun phrases with disastrous impact on the link structure. Wikipedia no longer uses WikiLinks, unfortunately, but almost every link remains anchored to a noun and almost no editors use links intelligently or creatively. They’re too busy being dragged to AN/I and AN/3 and dozens of other Wikipedia noticeboards over interminably wrangles on “Wikipedia policy” brought by the legions of Qworty. I think Wikipedia’s about over. To say, “some of this book’s footnotes are just links to Wikipedia articles” is universally understood to be withering. We don’t edit Wikipedia anymore. We don’t consult it for things that matter. It’s merely a good resource for finding odd facts no one cares much about. What was the name of Alexis Denisof’s character on Buffy? Was Pride and Prejudice 1812 or 1813? Is Jimmy Wales still paying attention? 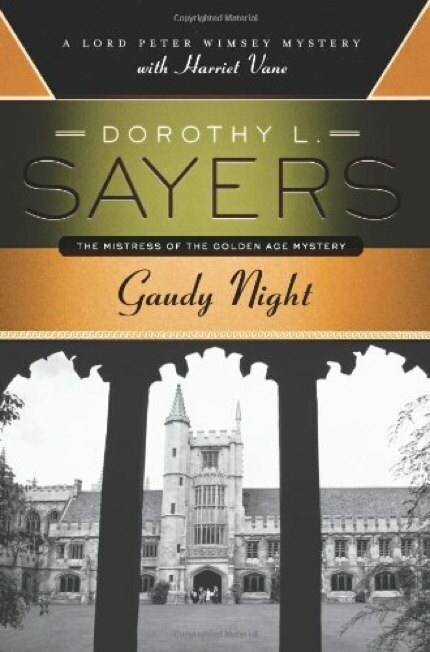 The best of Dorothy Sayers’ mysteries and among the best mysteries of all time. The Oxford of Gaudy Night is a wonderful wish-fulfillment fantasy where all smart people have read one’s books, have discussed them with their friends, and have intelligent questions about them at their fingertips. The Aaron Swartz page of Wikipedia is heating up again, alas. One guy is determined that Wikipedia calls this an alleged suicide. Because who knows? Besides, all the secondary sources refer to primary sources, and we’re supposed to depend on secondary sources, so Wikipedia has to refer to the event as contingent or suspected. Hint: the flaws of induction are not our fault. The sun also rises. This recalls the old mishaps at Dave Winer’s page. That page was contested for years over a host of issues and by a bunch of editors. But it turns out the whole controversy arose from a single editor, someone Winer had slighted once many years ago. That editor and his sock puppets kept the thing in turmoil for ages. When he was ultimately banned, everything immediately settled down. Consensus rule requires good will and discipline. You can’t do without either. Wikipedia is a magnet for cranks and crackpots and the pajamas crowd. When Wikipedia pages stay far from controversy, they can be useful. But I don’t see how you can keep any page safe from the crackpots forever while maintaining the Wiki Way. Let’s face it: wikis are for coherent communities with shared values and possessing some mechanism, explicit or implicit, to sanction bad behavior. Wikipedia has tried to evolve its own community through Wikisym and WikiFest and its own sanctions through its disciplinary process, but neither is entire convincing and both require a huge expenditure of effort in which smart and talented people spend exorbitant amounts of time policing petulant children. In a letter to the NY Times, Elizabeth Daniel asks how we can expect people to cook. Try getting home at 6 or 7 with children weary from after school, starting your fresh-cooked dinner and supervising homework at the same time. By the way, when did you buy those veggies and that salmon? I don’t have children and I don’t supervise homework. But still: I don’t see the problem. I’ve got a 40-minute commute. That’s a nuisance, but it can’t be helped. On a typical day, I’ll knock off work around 7. I stop off at the grocery on the way home, and often I’ll grab a hunk of salmon and a lettuce or a handful of asparagus. That takes ten, fifteen minutes. So, I’m home sometime after eight. I can do something easy with the salmon in half an hour, including a fifteen minute marinade. Then grill it, or maybe coat it in thyme and sesame seeds and sear it, drizzle some balsamic on top. Hell, go wild and try a Hollandaise or a sauce Gribiche; it’ll take five minutes and if it doesn’t work the first time, you didn’t need it. Set the table, open a bottle of Sauvignon Blanc, light a candle, you’re good to go. OK: most nights I skip the candle. In the NY Times, Ellen Ullman recalls her youth. I broke into the ranks of computing in the early 1980s, when women were just starting to poke their shoulder pads through crowds of men. Grace Hopper wore shoulder boards rather than shoulder pads, as naval officers will. While Ullman was working at her first programming job, the president of the ACM was Jean Sammet. Adele Goldberg was about to be the top name on the most important and influential computer science book of the decade, Smalltalk-80. Irene Greif was working on shared calendars, Janet Walker was working on LISP machines. There had always been some women in computing and there had never been a professional effort to systematically exclude women, as there had been in medicine and journalism. I don’t suppose anyone thought twice about sending Quinn Norton to cover Anonymous, but I can remember the storm over Lisa Olsen’s assignment to the Patriots. And I still raise an eyebrow whenever I turn to the Yankees broadcast and hear Suzyn Waldman. Things today are not right. They haven’t improved as quickly as we wanted or expected. But I’m not sure it helps to render invisible the generations of women who had already made vital contributions to programming. Michael Ruhlman loses his temper: America Has A Serious Eating Disorder. The disorder, broadly speaking, is that we use food as the occasion of guilt. We worry about food. We shouldn’t. Worry about your friends and your family and the girl who was expelled for fooling around with chemistry. Don’t worry about your food. Specifically, our eating disorder is that some of us get stuck in a rut when we don’t need to. Salt might be good for you or bad for you, but it’s pretty clear that a varied diet is a good thing. Don’t eat only french fries, and don’t eat only lettuce. Don’t have steak and potatoes every night. Don’t live on rice and beans. Eat different food, not all of it “healthy.” You’ll last longer. For most of history, almost no one had a choice. Orwell visited Wigan Pier in 1937, where he saw plenty of little kids who are alive and well today. But those kids couldn’t vary their diet much because nobody could. If you were prosperous, you might have meat once a week for Sunday dinner. If not, you might have meat for Christmas. Lots of people still have too few choices. But if you can choose, mix it up. And don’t forget the pie: stress cannot exist in the presence of pie. Meanwhile, Tony Maws loses his temper too over some kids from Culinary Institute of America who dropped into Craigie on Main during Spring break and were too busy dissecting the food to have a good time. When your child is old, do you really think they’ll be happy that they studied Health Care Administration when they had dreamed of building wonderful buildings or studying lost civilizations? Each of the five recommended majors has a stock photo picture of a happy graduate. The accountant, teacher, finance major, and health care admin are all women. The young manager is not. Some details might help Tinderbox novices follow “Designing A Conference With Tinderbox.” If you haven’t read that post already, you should probably read it first. 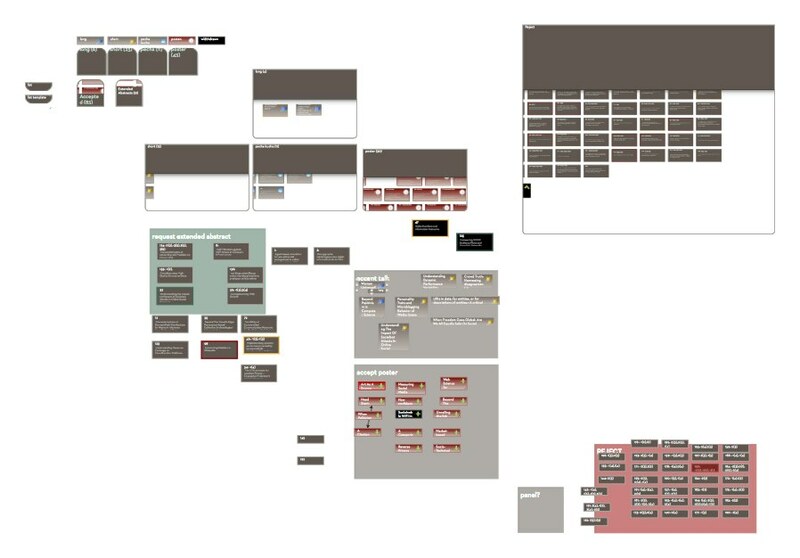 I seldom build a tree of prototypes in Tinderbox, but this task is an exception. We have a prototype Paper that represents a submitted research paper. It has the key attributes you’d expect: author, title, submission number, reviewer scores, and the email address of the corresponding author. Add some distinctive appearance, so it’s easy to scan a complex map and pick out the accepted papers. Provide an easy handle for agents that want to search for all the accepted papers, or for specific kinds of accepted paper. 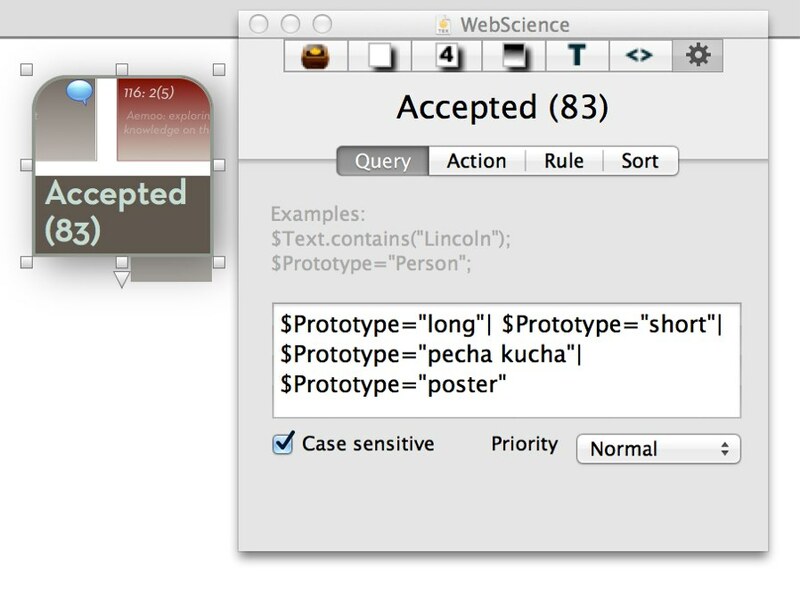 Web Science ’13, like many conferences, uses the EasyChair Web application to coordinate reviewers. EasyChair is a headache, but perhaps less of a headache than the old days where we photocopies every paper four times, stuffed and mailed a hundred envelopes, and collated reviews on paper tally lists. EasyChair gives you a convenient count of the number of acceptances you’ve sent. Obviously, we want to be confident that our own records and EasyChair’s are in sync. One way to increase our confidence is to check that the number of accepted papers in each category matches the number of EasyChair acceptances. An agent can make short work of this. We simply look for all the notes that have the appropriate prototype, count them up, and check the total against the number of acceptance emails. If they don’t match, you know you’d better go hunt down the discrepancy! Even then, you never know. One author of an accepted paper didn’t read his email with sufficient care, and assumed his paper had been accepted for a workshop. He came, read his paper to the workshop, and left Paris. Only as he used the train’s wifi on the return voyage did he realize his mistake. That was awkward, but not as awkward as the encounter would be with a researcher who has travelled a long distance at great expense, only to find their presentation is not on the program. Using the prototype Tinderbox Six to manage the program was a risk. Through the process, the software changed from day to day, and it was not unusual for progress on the conference to require a quick fix to the software. Many details of the screen layout in these examples will therefore look a bit strange to today’s Tinderbox 5.12 users, and they’ll doubtless seem quaint when Tinderbox Six is actually released. I also kept my conference notes in Tinderbox Six, such as they were — program chairs have many distractions, I was on stage a lot and it’s hard to take notes when you’re on stage. As usual, the left margin is reserved for notes to myself — especially notes about #Tinderbox features that I wanted as I made the notes. For example, the test version I was using didn’t understand that double-clicking an adornment should create a new note, just like double-clicking in the background of the map. This is the sort of thing that Test Driven Development doesn’t catch (it’s a dog that didn’t bark in the night) but that is still very good to know about. Tinderbox Six was well behaved through the conference, giving us a little more confidence as we approach the widening of the circle. At the close of Web Science 13, conference chair Prof. Hugh Davis said some very kind things about the construction of the program. During the final deliberations, he was in Southampton and I was in San Francisco. When we made the final decisions late in the Southampton evening. it seemed we had a big bundle of ill-assorted papers. When Hugh awoke the next morning, all the papers were neatly sorted into sessions and assembled into a draft program. Though Tinderbox isn’t designed for this task, it turns out that Tinderbox does it quite well. I’d like to walk through it in some detail — perhaps too much detail — because the task is itself not uncommon or unimportant, and because lots of other scheduling have similar properties. You never have enough time to plan the program for a peer-reviewed conference. On the one hand, the deadlines for submitting papers and for submitting peer reviews need to be as late as they possibly can be. You want the latest results at the conference and the best results of the moment – not the best of last year. These days, researchers tend to submit late, and reviewers are even less punctual. While it’s possible to take a firm line with authors, reviewers have the upper hand and they know it; they’re important and busy people and you need their reviews more than they need you. But once the reviews are in, there’s lots of pressure from the other end to have a final program. The Proceedings Chair wants the list of papers, yesterday. The Publicity Chair needs a program to publicize. The Powers That Be are always very edgy at this moment; they’ve committed to almost all the conference expenditures at this point and they’re terrified that no one will come. It never fails: the grizzled and ultra-competent Professor who has done this dozens of times before will, inevitably, wake up at this point in a cold sweat and email everyone to demand a finished program right away. We’re not buying lunch, and this is France; we need to allow plenty of time for a lunch break. Now, other conferences have different constraints, and some of these constraints might be finessed. 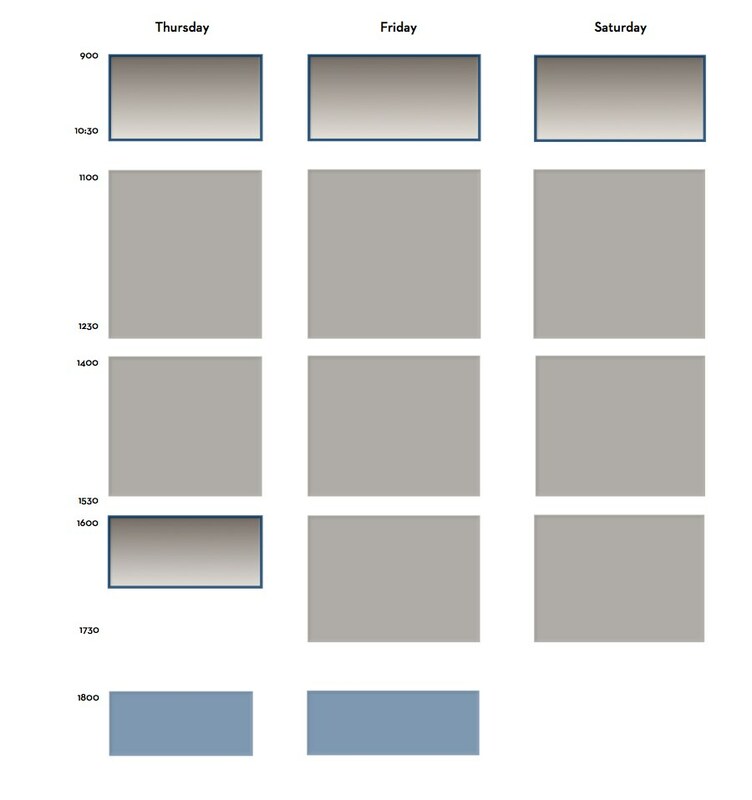 Computer Science conferences, for example, never have evening sessions. Biochemistry conferences do, and that’s an arrow for our quiver if we need one. All these constraints can be hard to keep in mind, but it’s easy to write them down in the form of a quickly sketched schedule. Each box is a Tinderbox adornment. Each label is an adornment, too. This doesn’t need to be precise or drawn to scale: it’s just a sketch. (Of course, it’s much larger and easier to read on your screen). Looking at this, we can see that we have eight sessions to plan. Each session runs 90 minutes and so can accommodate 3 long papers, 6 short papers, or some combination of long and short papers. So, we could possibly accept as many as 48 short papers. Web Science always has a poster session as part of the main program. It’s unusually strong, featuring good work from senior researchers. 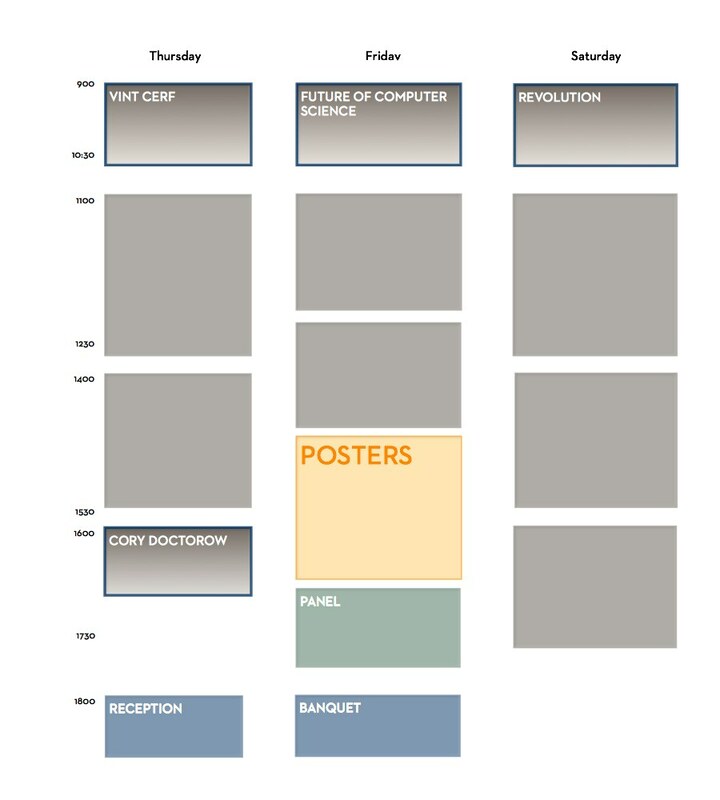 It’s tough to get experienced people to do posters, which in other conferences are dominated by student work, so we need to give posters a large and prominent slot. But we already have two keynotes on day 1! We’ll put the posters on Day 2, and give them 2 hours. But then the coffee break — which is again fixed by the venue contract — falls at the end of the posters. So, we’ll move lunch a little earlier, split the morning session in half, and now the coffee break falls conveniently at the midpoint of the poster session. We’ve got an odd space at the end of the day, but I’ve got some ideas for a setting up an invited panel anyway in the name of program balance. So now we have six sessions of research papers. I’m not happy that three of them fall on Day 3, but decide that can’t be helped. We’re still well in advance of making program decisions at this point. Reviewers are reading and pondering their assignments. We’ve got a lot of submissions — 198 — and lots of interesting topics. My own impression, though, is that we don’t have many papers that stand head and shoulders above the rest. Making decisions will be difficult. In addition, I’ve been worried for years about the quality of presentations at research conferences. I work at my talks, but I have to: I have the legacy of a speech impediment and the handicap of choosing topics that are usually unfamiliar. Lots of researchers are not especially talented presenters, but there’s no reason to expect they would be. You wouldn’t expect researchers to be especially good singers or right fielders, either. Pecha kucha talks (about which I’ll write more later) are usually considered a risk-averse programming technique, a way of minimizing the damage one lousy presentation can do. That’s not my concern here; we’ve got the whole arsenal of peer review to cover that. But the discipline of 20 slides, changing every 20 seconds, helps bring out the strengths and hide the weaknesses of academic presenters. No one uses enough slides: here, the format insists on it. Too many presenters forget to speak up; here, they’ve got the adrenaline rush of summing up years of research in 400 seconds. Students, especially, tend to get lost in a forest of detail, but with only 20 seconds per slide, they’re constantly reminded of the need to explain the big picture. The peer review process identifies acceptable talks. Every paper is read by at least three reviewers. I try to mix expertise and disciplines in assigning reviews, so we often have very different people discussing the same paper. Difficult or contentious papers get additional reviewers. Some have five or six. The goal is to accept every paper that is acceptable, but none that are not. In addition, we have some tight constraints. Wall space limits us to 45 posters. Our five sessions can fit 15 long papers or 30 short papers. We’ve already lined up the 11 pecha kucha papers. Lots of conferences use posters as a training ground, but at Web Science we want them to be a first rate venue. Some papers lend themselves to posters. The last point bears some elaboration. Occasionally, conferences receive papers that are difficult to evaluate because they are methodologically unorthodox. Reviewers are not confident that the results are wrong, but strong doubts are expressed. Discussion will improve the underlying work, but how can you arrange for that discussion? Referee reports may not be enough, especially not if the author simple assumes the the reviewer is hostile or has failed to understand their work. A paper presentation might not work, either, because even a carefully prepared question might get bogged down in details in which most of the audience isn’t interested. Posters are perfect for this; you can meet with people and establish that (a) you’re a reasonable fellow, (b) you understand their work, but (c) they could be more convincing if only they addressed some objections. Conversely, some topics lend themselves to presentations. Lots of people will bypass a poster titled “Dogs bite!” assuming that it is student work, confirming what everyone already knows. Sometimes, this sort of research cleverly demonstrates what everyone knew but nobody could actually prove. Sometimes, we demonstrate what everyone thought they knew, but could not really have known before our new experiment. This rhetoric is more effective in a dramatic presentation than in a poster; the poster has to disclose the punchline at the outset where the presentation can build up to it properly. So, at the end of the day we have about 30 papers destined to be posters. Now we start to build up some sessions. The hard work of pulling together 700 reviews of nearly 200 papers led to a very complicated workspace that I used during program committee meetings. Every review was read, every paper examined, and most papers were discussed in some detail. In the end, we had a list of papers that were clearly acceptable, papers that clearly needed more work or that would find a better audience at a different conference, and perhaps a dozen papers on the bubble. It was time too build some sessions. I had to start somewhere. 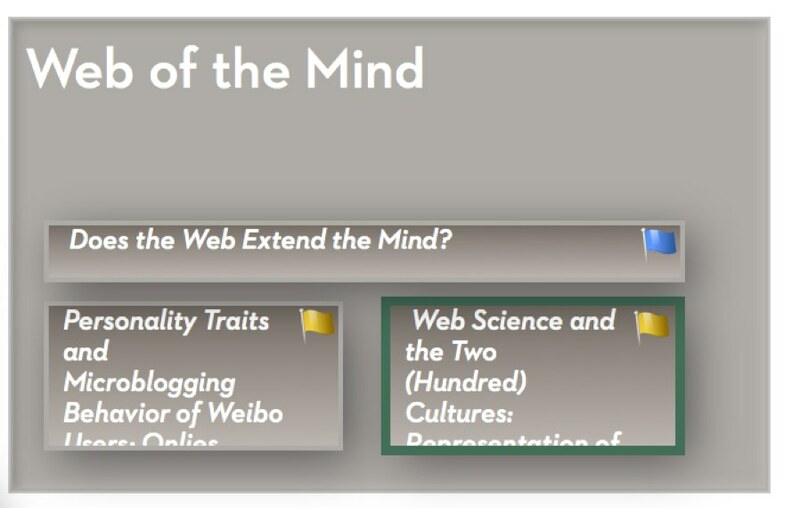 I picked up Harry Halpin’s “Does The Web Extend The Mind?” It’s got to be a presentation — it’s a philosophy paper, it’s dense, there’s no obvious visual hook. Halpin’s got a panel on Day 3, and I’m not sure this paper is ideal in the leadoff spot on Day 1. So it’s the opening act on Day 2. We don’t have any other papers on the same topic, but we’ve got two papers that harmonize nicely with its psychological concerns. The mechanics of this are really easy. I make an alias of the paper’s note from the program committee workspace and then paste the alias onto the program adornment. The original note carries metadata like paper number and author email addresses, so those are carried along with the alias. We’ve only got an hour in this split session, so we pencil in one long and two short paper sessions, and we give the session a title. 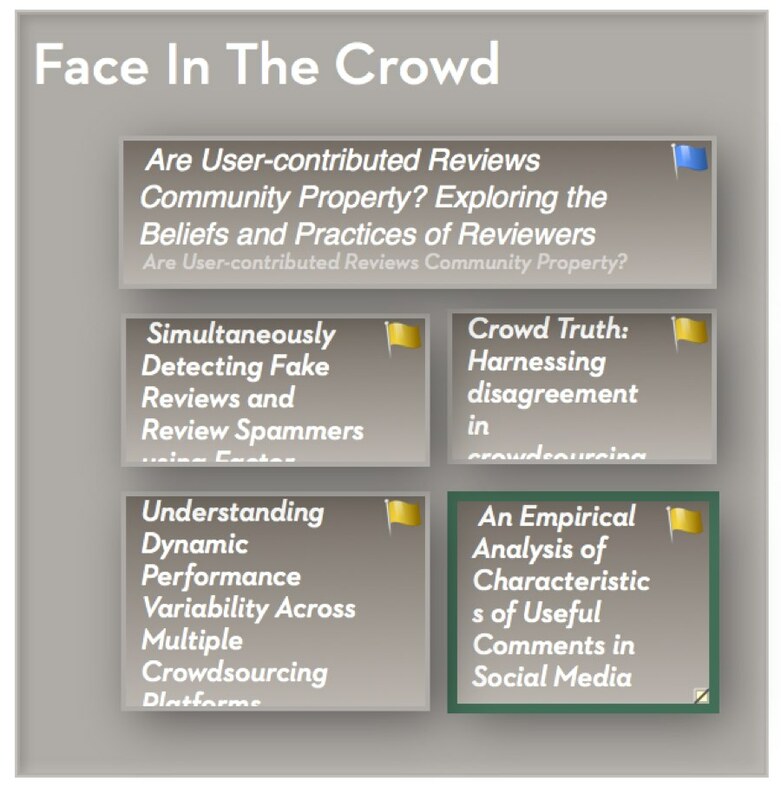 Going back to the pool of accepted papers, I notice a study about people’s attitudes toward user-contributed reviews. This concerns ownership of crowd-sourced material, and Cory Doctorow, slated to close Day 1, is a renowned intellectual property activist. So, it would be nice if this paper were on Day 1, but not so close to the keynote that it steps on its toes. But this one can bat leadoff – it’s classic Web Science material. Again, there’s nothing else much like it but we have lots of papers about user-contributed material and also lots of papers about crowdsourcing. It’s easy to imagine a session. Most of the other sessions are equally easy to assemble. The session on Journalism and the News assembles itself. Another collects interesting papers about affinity, ranging from financial sentiment on Twitter and general concepts of privacy to gender in Facebook profiles. The remaining papers break down fairly neatly into those chiefly interested in networks and those concerned with representing data (or people). Suddenly, we’re done. Much of this could be done in a graphics package like Visio, or OmniGraffle. But in Tinderbox, because each of those notes already has the title, author list, and lots more metadata, it was easy to write a quick export template to format the draft program, including the pecha kucha session and the list of accepted posters. All this went straight into Pages (I might easily have used Scrivener) where I fixed the formatting and made sure everything was right. It was also easy to write agents to do simple checks. How many papers and posters were in the program? How did they compare to the number of acceptance emails we had sent? At this point, I noticed that the program showed we had accepted one poster too many. Were we listing as accepted a poster we had actually rejected? It turned out to be a clerical blunder — I’d made two aliases of one poster and hadn’t noticed the spare. But Tinderbox made it easy to check the number of papers and posters in the program against the number of acceptances we had sent out. It would be awkward to have rejected a paper and then have the researcher show up at the conference empty-handed, only to be asked to do a presentation. Double-entry accounting is your friend. So, a few hours after the final decisions were made, we had a nice draft program ready for discussion. Additional changes would be made, but the bones of the program were all in place. When changes were needed, moreover, it was easy to move papers in the Tinderbox map and see the impact on the program. A girl takes off her shirt in Tunisia and gets on the wrong side of the authorities and we’re protesting across the globe. Now, a girl has Fun With Science in Florida and she’s a felon? 16-year-old Kiera Wilmot heard about a nifty science experiment. She took an 8oz plastic bottle, put some aluminum foil inside, some Sodium Hydroxide, and closed the bottle. It’s exothermic, it generates hydrogen and sodium aluminate. The plastic top eventually goes pop. When we did this in school, we said, “cool!” I’m pretty sure we did do exactly this, in fact: Blake Hannaford (now a robotics professor), Harris Suzuki (retired young from a successful investing career), Michael Harris (gentleman), and I. Michael Druzinsky (composer) might have been there too. But, seriously folks, this is very bad news for American education. How anti-intellectual have we become when, even in the deepest South, we want to expel and jail kids for a science experiment? And where the f____ is the American Chemical Society’s statement of solidarity with the girl? Update: Good report from DNLee at Scientific American. Back from WebSci, I’ve been immersed in Tinderbox Six links. We need to build out some link-editing tools to move forward, but that’s been slow as molasses. A few days away from the coding and I feel like I’m a batter returning from a stint on the disabled list to a 1-for-17 slump. It’s been made worse because I jumped straight into a rewrite of SLine, the abstraction that handles lines, polygons, and curves. It’s nominally “new” code, but it’s the oldest class of the new code and it has lots of scuffs and extensions and whatnot. But it’s also tricky code where getting stuff slightly wrong makes bad things happen — for example, I lost a couple of hours because the arrow heads of links were sometimes drawn at an angle that didn’t look (and wasn’t) quite right. More good news: not only did I do all the conference planning in Tinderbox Six, I took conference notes in Six as well. And there were no crash logs with a Paris dateline. None. We’re getting there. From technical solutions to impetuous twittering to methodological questions in using Amazon Mechanical Turk to the nature of online prayer, we’re covering a lot of ground. In the end, we have no choice. There are plenty of people who study some facet of the Web. 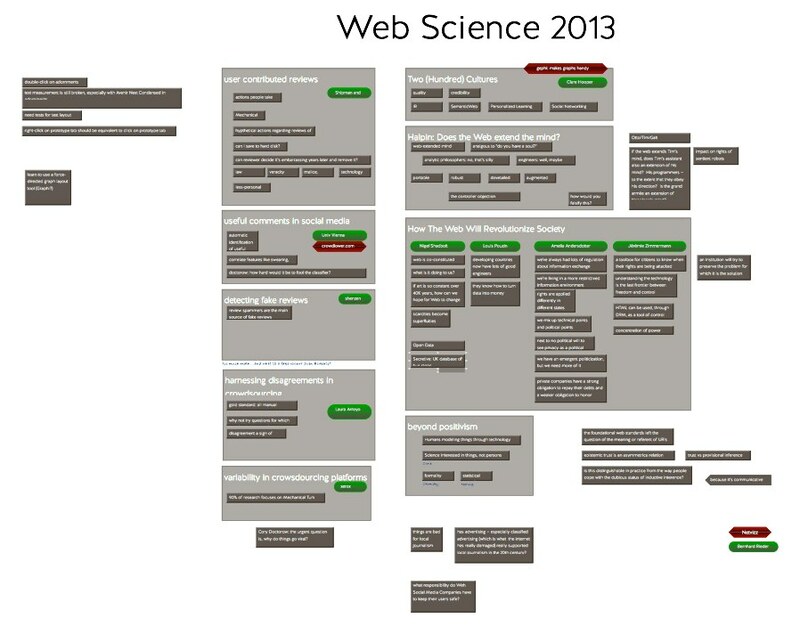 Web Science studies the Web as an entire phenomenon. It’s not just the plumbing and it’s not just the sociology and its not just philosophy. Web Science it the place where philosophy informs the plumbing. This makes for nifty sessions — you’ve got to love the transition between papers 5, 6, and 7 — but it also creates real tensions. A paper on the nature of trust, for example, simply cannot be correct in the way that a paper on information retrieval can. Then again, lots of people will be able to follow at least part of a paper about trust, but if you’ve forgotten what an eigenvalue is or why the intentional fallacy is false, it’s not hard to get lost in a paper whose author considers the argument straightforward. In one of my first talks, I got a Nobel laureate completely confused about the elements of my experiment. That was a useful lesson: everyone has a hard time with hard ideas. You’ve spent months or years alone with your problem in a dark room, but your audience hasn’t met it before. Take it easy; they won’t be bored with a few minutes review and they won’t think you’re dim. One significant problem at Web Science right now is a failure of imagination: how do our small studies suggest great consequences? This is not to say that writers should claim too much or write incautiously. But consequences that might rock your own province can strike people from other fields as obscure, and can seem pedantic or worse to people who have work to do. Web Science is still not very good at working with people who build Web sites and invent Web apps, the very people we ought to be serving and to whom we ought to be listening. For that, we need every eigenvalue, every statistic, and every construct in our toolbox. What is this saying? I think it says a lot. First, it tastes good! It’s reasonably balanced and reasonably healthy. It concentrates on things that it makes sense to eat at a restaurant, even if you cook, because they depend on lots of time-consuming products or require ingredients you don’t have. Tonka beans, for example, are banned in the US, and Madame Hisada is a long trek from Boston. Second, this is a wildly untraditional format. The ancient ancestor of the restaurant, the table d’hôte, did have a fixed menu: you came and ate what they made there. If you wanted roast chicken, you went to the fellow who roasted chicken and not to the fellow who stewed lamb. The other tradition grew out of health food and is what we call a restaurant: it had a list of broths and foods and potions and would fix up whatever your doctor ordered. But the restaurant menu settled down to an entrée, a plat, and a dessert, with maybe an apéro first and some mignardises later. In Italy, you’d add a pasta course, and in England you might have a fish course. But all these small courses are something new here; Alexander Lobrano calls it a public dinner party. It’s been controversial. And it returns, I think, to a very old discussion that Paris has had with America, the Ben Franklin admiration of gentle rusticity, of the new world’s projection of informality into ritual and thereby to get back to the heart of the thing. Simple, comfortable tables and simple, comfortable service are the modern translation of Franklin’s well-tailored homespun suits. The food matters and that’s why we’re all here, so let’s not stand on ceremony. There are allusions in the food as well. I’m missing lots of them, I’m sure, but composing the menu as a list of ingredients can only be a nod to Alinea. I don’t know what a banka trout looks like when it’s at home, but if you Google it you’ll find that the top hits all go to Frenchie, George Marchand’s famous foodie destination of this Parisian moment. In Back Of The House , Scott Haas makes an interesting point about chef Tony Maws (Craigie on Main). Lots of American celebrity chefs were raised to consider themselves poor, and until very recently all traditionally-trained cooks in France were working class men. Maws grew up in upper-middle-class Boston; his family eats at Craigie because it’s the sort of place they’ve always gone. That changes and defuses a lot of the class tension that underlies restaurant ritual. Yesterday’s restauranteur was a servant, though perhaps one with valued expertise. California service reminds us that this is just a convention. “I’ll be your server tonight” acknowledges that tomorrow, you may be my server. For Brecht/Weil, that transition required a black freighter mit fünfzig Kanonen. Here, now, it’s every day. There’s more to work through here, I think, and a lot that I’m missing. That’s OK, too: we don’t need to understand every element in the meal or follow every argument. But this is a meal with something to say. Not whispered but not shouted, it stands up and speaks out. Of course, that conference has been over for years. I think, though, that there’s a useful idea here, one that casts some light on what I call the Treaty For Web Science, about which I hope to write soon. So I’ve rewritten and extended the post here. Here, I think we've wandered into the swamp or stepped off the end of the pier. If there's no such thing, for example, as selecting from strict academic quality, then universities are just social clubs where some lucky people get to distribute lots of money to their attractive and well-connected friends. That can't be right. One could, I think, assemble a technical conference program from purely objective criteria that would likely correlate with "quality". We might need to fine-tune our metrics; that's why this is hard. It doesn't mean it can't be done. Is it possible to select the best 5 novels of the year, arguing strictly from literary quality and nothing else? Most people think this is a plausible enterprise, though it's bound to be difficult. The National Book Award, the Booker, the Pulitzer – they'd mean nothing if people thought they were rigged or jobbed or arbitrary. As it happens, the last National Book Award (i.e. 2004 or 2005) ended up short-listing five novels. All five were written by women. All were "small" novels. None sold very well. A number of other novelists (Philip Roth, Tom Wolfe) wrote books that were eligible, but weren't nominated. If we neglect the questions raised by Middlesex, we'd expect that all five books on the short list would be written by people of one gender or the other about once every fifteen years, just from luck. It's possible that Roth's maleness worked against him, it's possible that judges thought he was already sufficiently famous, or that having already won the prize, he didn't need another shiny object. It's possible that the judges simply liked the other books more. Writing in The Believer, National Book Award chairman Rick Moody – no slouch of a writer – said that's just the way it turned out. Moody thinks the resentment is, at core, anti-intellectual: famous writers should create the best books, right? He's got a nice polemic on how anti-intellectual spleen has no place in the National Book Award, and how the media furor surrounding the award infantilizes the American book-loving public. 2013: What I didn’t appreciate sufficiently in 2005 is the way this disagreement illuminates a disciplinary boundary. My friend is a humanist steeped in postmodern thought. My background lies in the physical sciences. We seem to be arguing politics, but we’re really arguing disciplinary faith. My friend’s position, I think, is that all these judgments are necessarily embedded in social contexts and understandings. We can’t truly know which novel was the best of 2013; it’s not really a question that makes any sense. The best we can hope to do is suggest which novel would be the best one for you to read right now. Someone else, at some other time, might find it dull or trite or impenetrable. And if we can’t choose the best novel, how can we choose the very best conference speaker? And might not being female sometimes in itself make one person a more effective speaker than another? Suppose you’re having a dinner party. Seven guests have been invited; your table can manage eight. Is there one best person to invite? Context is everything here, and it’s entirely possible that balancing genders, personalities, and interests will lead to the best answer. Is the work completely correct? Does it suggest exciting new avenues for research? Might it have important practical consequences? No one can read a new novel and tell you with confidence whether it’s going to inspire lots of novels or not. For plenty of computer science papers, on the other hand, this is immediately apparent. In literature, it might be interesting to hear someone with talent expound a position that’s almost certainly wrong: Edmund Wilson’s case against The Lord Of The Ring, or Jane Smiley’s rejection of Huckleberry Finn. This is even more true in History, which thrives on energetic defenses of such seemingly-indefensible positions as “our sympathies should lie with Sparta, not Athens” or “it might have been better for everyone if Britain had let Germany win WW1.” Even if it turns out that the new argument doesn’t quite hold up, the attempt may well repay some time and effort by giving us a broader understanding and deeper sympathy. But in science, wrong is wrong. And few things would be more wrong than preferring paper A to paper B because the author of A, though he’s clearly made a blunder this time, is an important fellow while the author of B is an unknown student from a backwater. To take the speaker’s podium away from B and give it to A would, in the sciences, be a revolting crime and a scandal. It’s unthinkable. A fairly precise parallel can be found in the Anglo-American legal tradition. Suppose Smith, a beloved movie star, has committed a serious crime. He is immensely wealthy. He is head of prominent charities and is considering running for office. Thousands of workers depend on him and would lose their jobs if he weren’t available to make his next film. May we excuse the crime? The Romans would have answered without hesitation, “yes.” But the Anglo-American tradition is unambiguous: though the sky fall, let justice be done. Now, even in the sciences we may have tough decisions. We might not catch a mistake. We might not know that something has already been published, especially if the first publication was obscure or if it used a different notation. Reasonable people can disagree over whether a given result is intriguing or rather dull. Committees can err. But, obviously, they must not commit crimes. Now, scientists are not (always) dim or parochial. They understand that people are fallible, and they understand that in other fields to ask for a judgment of whether a conclusion is wrong is to ask too much. It’s impossible to apply the standards of physical chemistry to a paper on ethics or narratology. But to consider persons, not facts, when choosing conference papers is going to make scientists very, very uncomfortable. 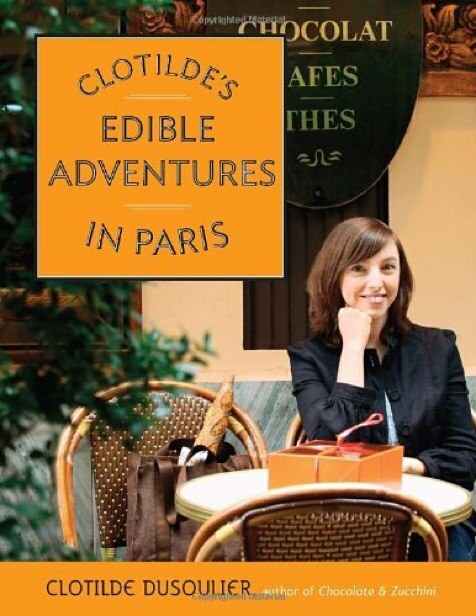 The proof of this lively guide to restaurants and food shops of Paris will lie in my upcoming trip, I suppose, but this is a pleasant and amusing little read, well above the usual guidebook fare. The book is replete with tasty sidebars about language, customs, habits, and these are its particular strength. Dusoulier’s weblog, Chocolate & Zucchini, captured my attention early on with a simple anecdote. Clotilde was having the neighbors to dinner, and she had a particularly nice wine. What should she cook? This was a revelation: no one had ever suggested to me that you could choose the wine first and build a meal around it, while every cookbook and wine seller talked all the time about pairing wine with particular foods. At restaurants, you always found out what people were ordering and then tried to pick a sensible wine; you never said, “Let’s have this interesting Bordeaux” first, leaving people to choose what they’d like to eat with that wine. Knowing how Clotildle was thinking about this opened up all sorts of possibilities. There’s some of that in this book, but not quite enough. Perhaps age and celebrity and a baby have made her more private. Perhaps it’s a desire to put the restauranteurs and storekeepers in the foreground. She was never a confessional blogger, but there’s not enough Clotilde here for her fans. And we could welcome even more of the book’s plentiful sidebars. Those macarons in the lovely bakeries: can you buy just one or two? Or does one buy a dozen? Everything else in today’s gastronomy rejects coloring: why are colors so prominent in macaroons? How does a hotel-bound visitor sample viennoiserie? OK: it’s (say) 1530 and you’re standing outside a famous bakery; is it OK to buy a single roll? 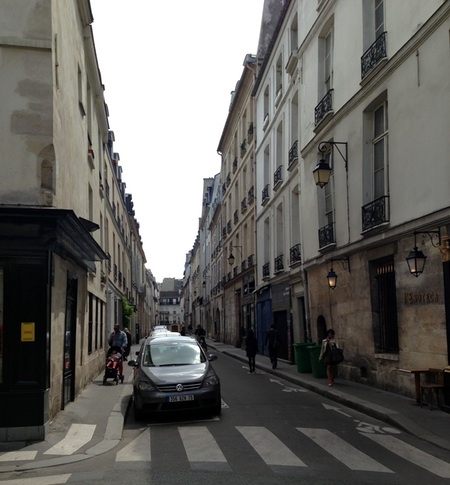 Should one buy a baguette and tear off chunks to eat as you stroll down the street, or is that obnoxious? Or should you buy that baguette first thing in the morning? As it turned out, we chased down two restaurant recommendations from Edible Adventures, and one bakery, and all were (of course) excellent. But this is Paris and there’s lots of good food, and plenty of people to tell you about it. What can we learn from these three? Interestingly, the staff at Les Papilles didn’t know about the book or about Clotilde. L’Entredgue is a neighborhood place in a neighborhood that is not terribly folkloric but that happens to be close to the Palais des Congrès where Web Science was held. Clotilde had given a wonderful presentation at Web Science the day before and a friend had ordered the book overnight on Amazon and reserved a table at this handy place. Again, it’s not very big and it’s not very conspicuous, but the cooking is very, very good. I had some foie gras, some delicious pork, and a tarte tatin. And it was exactly right for a conference dinner: lively but not raucous, comfortable but not boring, with food that was interesting but not frightening. In the mornings, we’d been taking our morning coffee and a croissant in the nearby Place Maubert, and they were very nice indeed. Even the conference croissants were terrific. But Clotilde speaks highly of Eric Kayser’s boulangerie down the street, so one day we grabbed two of his pain au chocolate. Wow! These are at once more tender and more flaky than I thought possible. We immediately bought a second pair to eat by the Seine. Astonishingly good. Again, it’s not so much the tip as the permission, the suggestion that you should stop and try this even if you don’t have to.